Super Bowl Parties were Super! We had an awesome opportunity to help with two high-end celebrity Superbowl parties this past weekend. A party producer from Dallas, William Ekuroth with Vertical Sports Group, needed help to add some “special touches” to the design of his parties. 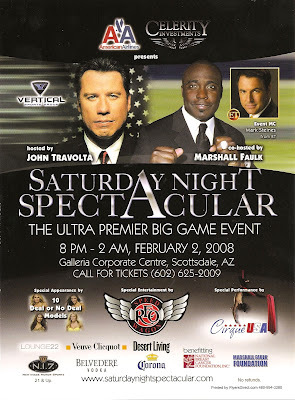 The events were held at the Scottsdale Galleria, Friday night was Carmen Electra’s Superbowl party and Saturday night was John Travolta’s Superbowl party. We thought this was a great opportunity to do something different and jumped on the idea. We decorated the entrance of the party with thousands of crystals and beads to create a rich elegant feeling as you walked into the party. We also draped black linen along the back of the entrance. Just to add extra detail we placed wax and glass vessels on the three levels of the venue that sat on the edge of the balconies. We lit the candles at night before the party started and it made the whole venue glow. We decorated all of the furniture for the event with hundreds of pillows, black for Friday, and white for Saturday. We also got the opportunity to work with a few of the alcohol sponsors Veuve Clicquot, Chandon, Belvedere. Life Design Event Planning on the Red Carpet! It was quite the experience, and even though we had less than two weeks to pull everything together, the final result was amazing! Pictures from the Pros to come.